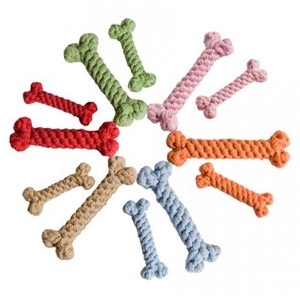 Keep your pup's teeth and gums clean with our rope dog toys! Ideal dog chew toys for teething puppies, just wet, freeze, and let 'em have at it. Made from 100% recycled cotton yarns, if our Cotton Rope Bone Toy gets dirty, just toss in it the wash. Clean teeth AND clean toys!